Ephemera is notoriously difficult to describe and thus bring to the attention of scholars. It is even difficult to know what things are, because scholars are normally concerned with scholarship, and not the tiny details of daily life and work to which ephemera almost exclusively relates. And when all who might remember these details are long dead, so that there is nobody to ask, the difficulties are often insuperable. I aim to describe all our Chinese ephemera in due course, and to identify it as best I can with the help of others. This is a large single-sheet item, bearing no title, so the title is simply a statement of what the item is, and was assigned to it by Xiang Da so that it could be included in his card catalogue. The “promotion chart” is simply an English translation of this description. The above image is too small to be legible – I reproduce it only to show what the chart looks like; the full image can be seen and examined here. Unfortunately, there is no individual entry for the chart, which is found under number 321, “Extracts from Peking Gazette, Treaties, &c.”, and in fact it is only because of later annotations to this entry that we know that this batch of materials comprised 3 printed volumes, 19 manuscript volumes, and 4 printed sheets, of which one was discarded as a duplicate in 1939 by EOW (Eric Otto Winstedt, who was keeper of the Oriental collections at the time). Let’s hope it wasn’t a duplicate of the chart! However, it is wrong. Although the chart does indeed depict the structure of the contemporary Chinese bureaucracy, it is not a directory, but a game. This, together with almost everything else I now know about the chart, I learned from Puk Wing Kin when he visited me in Oxford in 2009. Most important to me as a cataloguer, he pointed out that certain characters in the chart are represented by simplified forms which are only homophonous in Cantonese. For example: you 由 is used for rou 柔 (both are pronounced yau in Cantonese), and zhuang 庄 is used for zang 贓 (in Cantonese both are pronounced jong). 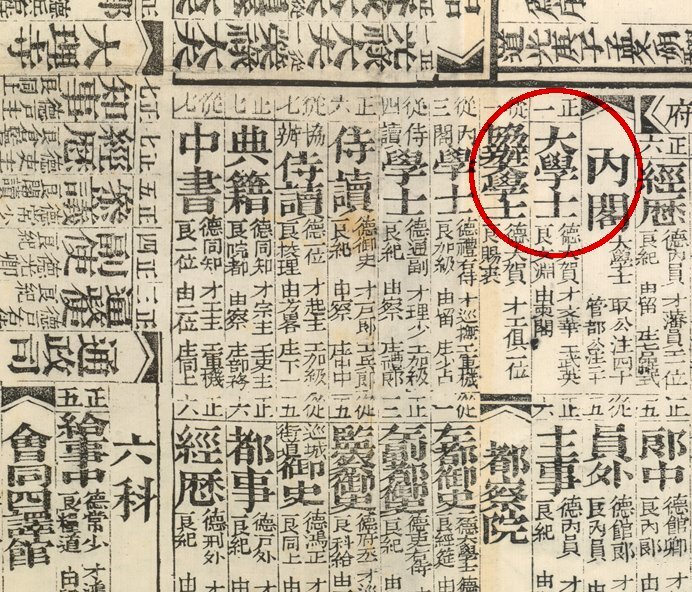 I was thus able to say with some certainty where the map was printed in my catalogue entry, rather than merely infer it from its provenance; the date of 1840 道光庚子 is clearly printed in the central panel. 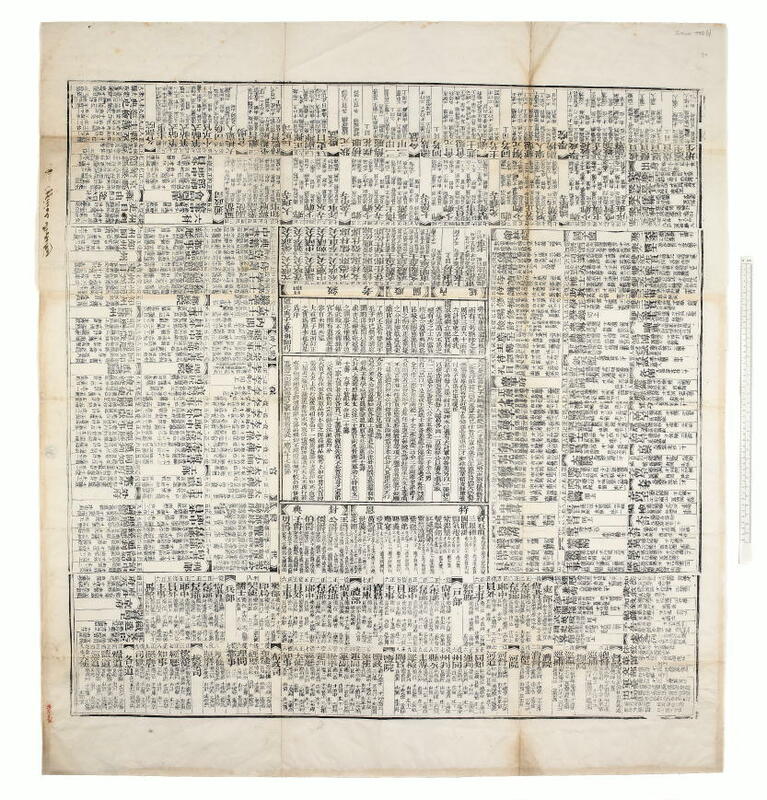 The two charts reproduced in large format in the book are facsimiles of ours and one printed in Shanghai in the Republican period. This involves a long series of promotions and demotions, as set forth in the small print in each of the rectangular panels, all determined by the roll of dice and the movement of counters. As in life, much depends on where one starts from, which in the game is again determined by the roll of dice. By playing the game, much can be learned about the bureaucratic structure of imperial China and how officials rose and fell within it, for which reason Wing Kin told me that he sometimes plays the game with his students. Although on one level the game is a very sophisticated form of snakes and ladders, perhaps its nearest western equivalent is Monopoly, which leads to a comparison of the two. While both are aleatory – games of chance depending on the roll of dice – whereas the aim of one is to attain the highest office in the land through virtuous conduct, that of the other is to become rich by bankrupting one’s neighbours. Food for thought here, don’t you think? I’m going to describe another piece of printed ephemera in my next blog entry, as it’s closely related. Appointment to any of the posts represented in the promotion chart depended on passing the official examinations that were periodically held at local, provincial, and metropolitan levels. We have a set of three papers that were used in the provincial examination at Nanchang in 1902 which I’d like to bring to your attention. They will be exhibited in the Proscholium of the Old Library for a few weeks from mid-February, the aim of the display being to illustrate the traditional Chinese preoccupation with success in examinations as the path to fame and fortune.